Here's the scenario: You have social profiles and pages set up on top-ranked social networks. You have a great content strategy to ensure you’re publishing on a daily basis to each network. But there’s something missing: customer engagement. Regularly updating social profiles and pages with quality content can help build engagement with fans. But to really connect with target customers, you have to find them and start those conversations. In this post, we're going to show you how to find target customers on the top social networks and how to create meaningful engagements. The goal is to increase exposure for your business and demonstrate your business's expertise in your particular industry. On Facebook, there are several ways to engage. The number of engagement options available depends on whether you want to use your personal profile or business page to connect with customers. If you choose to use your personal profile to connect with customers, there are three key edits you should consider to ensure success. 1. Add your business as your current employer. On your personal profile “About” tab, you will find a work and education section. Set your current place of work as your business by selecting your business's Facebook page in the company field. The result? People who find you or visit your profile will be able to connect directly to your business page. 2. Edit your contact info to include public information. Facebook’s “About” tab also houses a section for contact information. To help your customers contact you, it’s wise to include some public information. This information should include, at a minimum, an email address and a link to your business website. Set to “public” visibility. 3. Make sure your public posts are professional. You don't necessarily have to remove every personal post from your Facebook page. Just set the privacy to “Friends Only” for posts you may not want target customers to find. If you friend target customers from your personal profile, consider using the “Close Friends” list for personal acquaintances and share personal posts only with that list. That way, you can be Facebook friends with customers without divulging more than you’d like. This setting is useful for those who may not have used their personal profile for marketing and need to quickly clean it up. Going forward, you can share only customer-friendly updates with the public. You can even open up your personal profile to followers so people can access your public updates without going through the friending process. Facebook groups are a hotbed of customer engagement opportunities. This is applicable to just about all business types. For example, local businesses (service providers, retailers, etc.) can find customers in local Facebook groups. Every Facebook group is different. Some are formed to help local customers connect with the businesses they seek. For example, you may find a local business referral group where people ask for recommendations on accountants, landscapers, photographers, and other service professionals. If you are in this group and offer one of these services, you can promote yourself. You may also find local groups where business promotion is not welcome, but if you are an active and helpful participant, people will get to know you. Ultimately, if they know what you do, they may recommend you to others when someone asks for a referral on or off Facebook. Non-local businesses can search for specific interest groups where target customers are likely to engage. For example, if you offer Facebook marketing services, join all of the groups for Facebook marketing and Facebook for businesses. You'll likely have plenty of opportunities to engage with your target customers who want Facebook marketing advice. The more helpful you are, the more likely you are to get hired by someone in the group. Engagement options are a little more limited when using Facebook as your page. But rather than post comments with your personal profile, you can use your Facebook page instead. To find customer engagement opportunities, start by looking for other pages on Facebook where your target customers discuss interests relevant to your business. Here are a few examples. For a company that provides monthly subscription boxes with pet-themed products, an ideal page to engage with target customers would be the Facebook page for a dog-focused magazine. And for a company that curates baby products, an ideal page to engage with would be the Facebook page for a pregnancy publication. The goal is to find non-competitive Facebook pages your customers like. Once you like those pages, you can login to Facebook, switch to using Facebook as your page, and go to your newsfeed. It will look similar to your personal feed, but also include the latest updates from the pages your page likes. To attract the attention of a target customer, reply directly to their comments as your page. The customer will receive a notification about your reply and have the chance to click straight through to your page. Most people share their status updates publicly on Twitter. Twitter allows users to search for status updates by keyword. Twitter allows users to search for people by keyword and follow them or add them to a list to follow people as a group. Here are a few ways to take advantage of these Twitter features to find and engage with your target customers. Second, you can search for keywords to find people seeking advice about your industry as a whole. In addition to gaining more exposure for your business and increasing your reputation in the industry, you'll likely grow your Twitter followers with this strategy. If you know your target customer demographic well, you can follow them using Twitter lists. Start by searching for people using Followerwonk. Unlike the main Twitter search, Followerwonk lets you search for people by keyword and location. As you find your target customers, add them to a Twitter list by clicking the “Setting Wheel” icon by the “Follow” button on their profile and choose the “Add or Remove From Lists” option. Create a private list for target customers. Then monitor that list for discussions related to your business. Be sure to join any conversation in which you feel comfortable participating with this group of people. As they become more familiar with your business, they will either look into your products and services for themselves or recommend you based on the value you provide them. Twitter chats unite people who want to talk about a particular topic. If your business should be an expert in a particular topic, then your business should participate in the Twitter chat related to that topic. The Twitter Chat Schedule has a list of hundreds of chats from agriculture to writing. Just visit the page and use CTRL+F to find a chat your business should join. To participate in a Twitter chat, consider use tools like Tweet Chat. Enter the hashtag for the chat you want to participate in, and Tweet Chat will pull in all of the latest tweets with that hashtag. When you're ready to contribute to the conversation, it will add the hashtag to your tweet. Note that Twitter chats are not about self-promotion. Instead, they’re about groups of people coming together to share valuable information. Unless someone directly asks you about your products or services, or a question in the chat relates directly to your products or services, you should keep your tweets promo free for best results. For any business whose target customers are business professionals, LinkedIn is the perfect social network to find and engage with customers. On LinkedIn, the best opportunities to engage with your target customers are available from your personal profile. If you choose to use your personal profile as a way to connect with customers, there is one key to ensure success. Think of your profile's headline as an opportunity to self-promote wherever you go on LinkedIn. It appears next to your name when you send a contact request, when you comment in a LinkedIn group, in search results, and in the “people also viewed” list that appears on other people's profiles. Think of your 120-character headline as your first impression on target customers. How would you sell someone on your products and services in 120 characters? By default, your headline is your job title and company. So instead of CEO at My Company, try CEO at Software Solution for Helping Small Business Owners Manage Employee Schedules Effectively. This headline tells anyone who sees it what your company does, and provides a name to search for if they want to learn more. Once you have perfected your headline, you should join and participate in LinkedIn groups. You can only be a member of 50 groups at a time, so be sure to choose wisely. Local businesses may want to start with locally based groups whereas non-local businesses may want to start with groups related to their industry. The goal is to join as many groups your target customers would participate in as possible. Because your headline will show up next to all of your posts and comments, create and comment on discussions to get the most out of your membership. If you find there aren't many good LinkedIn groups for your target customers, it can mean one of two things. One, your target customers are not on LinkedIn. Or two, no one has created a great group for your target customers yet. 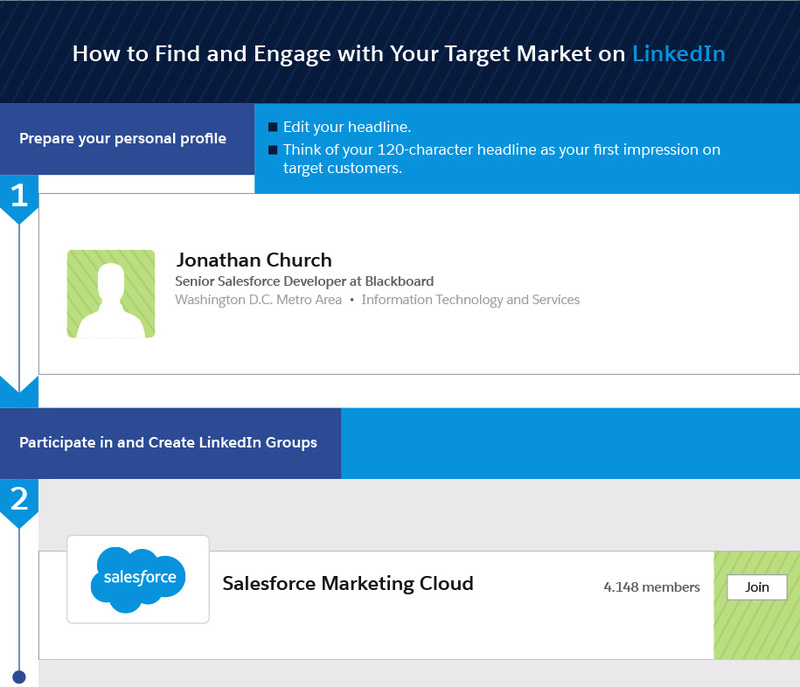 To solve the latter problem, create a LinkedIn group to attract your target customers. When you own a LinkedIn group, you can email group members once a week with a custom message. This allows you to turn your LinkedIn group into a lead generation opportunity. 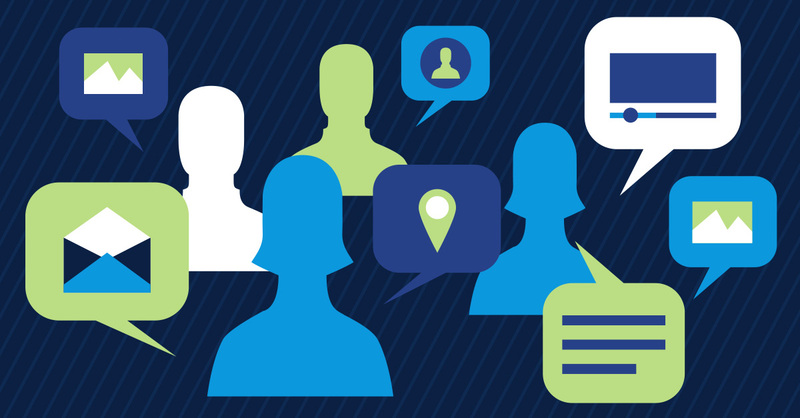 Create a group for inbound marketers to discuss inbound marketing strategies. Email the group once a week about a new webinar on the latest inbound marketing techniques. Use the webinar to convert your group members into users of your software. Even if you don't get to steps two and three, by creating a LinkedIn group for your target customers, you can attract your target customer and engage with them freely. Converting group members into leads and customers is just a bonus. By connecting with and actively engaging your target customers on social media, you will increase exposure for your business and establish your business as an industry authority. This strategy will put the social into your social media strategy and help generate business.